Ever since it came to power by way of armed struggle in 1991, the Government of Ethiopia had been implementing agricultural led industrialization (ADLI) development policy.The government repeatedly declared achievements of its policy in the reduction of poverty are much better than any previous rulers of the country and any government in the sub-Sahara region. The government is not alone in this declaration. Its bravados are endorsed by international organizations. What makes the endorsements by these organizations unreliable is that they are based on the data provided by the government of Ethiopia which is manipulated and doctored to fit its self-serving interest. Development in Ethiopia is not only belonged to an economic realm rather it an ideology to justify authoritarian rule. Therefore, development datas are cooked to suit official narratives of of continued “double digit growth”. However, to the contrary international studies and the reality on the ground showed the agriculture-led-industrialization policy cannot bring real development and reduce poverty. As a result, after a quarter of its implementations Ethiopia remains one of the world’s poorest country. More than 12 million people are chronically, if not periodically food insecure. According to the World Bank 2012 report, population below national poverty line in Ethiopia is 38.9%. The poverty gap index is estimated to be 7.8% while it is 8.0% for rural areas and 6.9% for urban areas. Agricultural production, which is the source of livelihood for eight out of ten Ethiopians, is extremely vulnerable to climatic conditions. The causes of rural poverty are many including wide fluctuations in agricultural production as a result of drought, ineffective and inefficient agricultural marketing system, underdeveloped transport and communication networks, underdeveloped production technologies, limited access of rural households to support services, environmental degradation and lack of participation by rural poor people in decision making that affect their livelihoods. Despite huge potential, Amhara region remains the poorest region in Ethiopia. It is mainly caused by the regime’s deliberate discriminatory economic policy towards Amhara people. Amhara is one of the regions significantly affected by worst and often recurrent drought. poverty level in the region is among the highest by most social and human development indicators. Many studies showed that highest food poverty is found in Amhara region. As land belonged to the state it is subject to redistribution or appropriation by the government. Therefore, farmers do not have tenure security that would give an incentive for more production. Second by redistributing land the Government creates a fragmented farmland that are not viable livelihood. The authoritarian rule in Ethiopia has further worsen the food insecurity by creating a clientele network of the party officials that would political administers the rural communities. To assess the extent and geographic dimension of poverty in Amhara region, the researcher used GIS and Small Area Estimation techniques. Various methods have been used to construct geographically disaggregated indicators of poverty (Davis, 2003). The most common is the small area estimation technique, developed in a series of World Bank researches and now applied to a number of countries, such as Ecuador, South Africa, Nicaragua, Vietnam, Kenya, and Uganda. The small area estimation (SAE) offers a powerful approach to produce statistically reliable poverty estimates for small areas and is the most widespread method for mapping on national scales (WB et al. 2009) cited in (Valerie, 2012). The method combines detailed household survey information with population census data. The idea is to use survey data to create a predictive model for a dependent variable that is available in the survey but not in the census. The independent variables included in the model are common to both the survey and the census data. The small area estimation technique uses regression models to predict the welfare indicators for all households covered by the census. The methodology (Elbers, 2003) contains three stages: zero, first and second. In the zero stage variables common to the survey and census are identified, and the two data sets are generally examined for comparability, sampling strategies, etc. In a first stage, regression parameters are estimated based on the variables that are common to both the survey and the census. In the second stage these parameter estimates are taken to the census data to predict the chosen welfare measure for each population of interest. 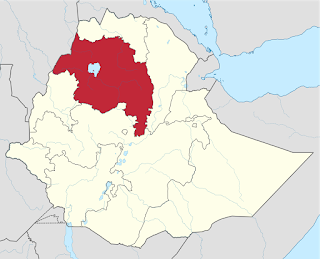 Amhara region is the poorest region in Ethiopia.The extent of poverty varies from district to district in the region. Lacks of equity in the access to productive resources and basic services and their consequential benefits as well as lack of access to opportunities to develop skills and human capabilities have impeded the socio-economic development of the poor in this region. That absences of the means by which the poor can address their problems and enhance their active participation in decision-making have hindered their attempts to move out of the state of deprivation. The spatial dimension of poverty in Amhara region was investigated by combining GIS and Small Area Estimation techniques. The data used are the 2007 Population and Housing Census and the 2010/11 HICE survey. Despite the ruling party denial, this research disclosed that poverty headcount in Amhara region ranges between 30- 45%. The dimension of poverty in this region is not the same. It varies significantly from place to place (Map1).The Extreme poverty is mainly found in the Northern and Northeastern parts of Amhara region. Relatively speaking, extent of poverty is low in the Southern and Southwestern parts of the region. As this study disclosed the 2015/2016 food shortage and drought highly affected the aforementioned poorest parts of Amhara region. If the government gives attention to what independent studies like shows, the catastrophe caused by this drought might be significantly minimized. However, the regime in power continued to suppress information that they thought to have adverse impact on their politics. The rural poor are doomed to suffer from deliberate discrimination and economic marginalization.. It is part of a strategy to perpetuate Tigrian ethnic dominations over the Amharas which they consider as their immediate thereat to be reduced to insignificant. Therefore, unless there is no change of government the trend will continue. Development under authoritative rule are uneven and discriminatory. In my opinion, the background causes of the current uprising and social unrest in Amhara region is mainly caused by deep rooted poverty and huge income disparity which are the results of the 25 years of ethnic based economic and political marginalization by the ruling party. The roots of current crisis and the Amhara predicament are attributable to above facts. This is an excerpt from my MA thesis, entitled “Spatial Dimension of Poverty in Rural Amhara Region, NW Ethiopia: Application of GIS and Small Area Estimation”and it has been modified and updated to incorporate current information.